Objectively, Sophie is a success: she’s got a coveted job at a top consulting firm, a Manhattan apartment, and a passport full of stamps. It isn’t quite what she dreamed of when she was a teenager dog-earing pages in exotic travel guides, but it’s secure. Then her best friend bails just hours after they arrive in Hong Kong for a girls’ trip, and Sophie falls for Carson, a free spirited, globetrotting American artist. He begs her to join him on his haphazard journey, but she chooses responsibility and her five-year plan. Back in New York, that plan feels less and less appealing. As Sophie recalls the dreams she’s suppressed, the brief international jaunts she sneaks in between business trips no longer feel like enough. Carson isn’t ready to let her go either, but as they try to figure out their relationship, Sophie realizes she may have to pursue her passions with or without him. Kristin Rockaway is a native New Yorker with an insatiable case of wanderlust. After working in the IT industry for far too many years, she finally traded the city for the surf and chased her dreams out to Southern California, where she spends her days happily writing stories instead of software. 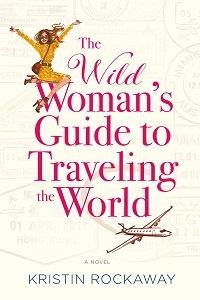 Her debut novel, The Wild Woman’s Guide to Traveling the World, was released from Hachette Book Group in June 2017. When she’s not writing, she enjoys spending time with her husband and son, browsing the aisles of her neighborhood bookstores, and planning her next big vacation. The Wild Woman’s Guide to Traveling the World is one of those novels you really wish was a travel guide, because Kristin Rockaway is so good at describing places and food, that you want to instantly jump through the pages to Hong Kong or New York, or… wherever. Fortunately, her skills at writing character and plot are just as good, so you jump into the pages of her story as well. I really enjoyed following Sophie on her journeys – both the literal and the emotional one – as she navigated not just the world, but her own needs and desires, as well as her own heart. It’s a scary thing to step off the path we’ve created for ourselves, and Carson was the perfect catalyst for Sophie to do just that. Rockaway has given us a couple that is passionate, funny, and may or may not be perfect for each other, which ultimately makes them both slightly heightened and supremely real. I really enjoyed the way Rockaway balanced the comedic and serious moments in this novel. I recommend it to anyone who longs for an escape, but isn’t sure they’re quite ready. Goes well with Asian street food, though I prefer Singaporean dishes to those from Hong Kong. Review: The Wild Woman’s Guide to Traveling the World, by Kristin Rockaway by Melissa Bartell is licensed under a Creative Commons Attribution-NonCommercial-ShareAlike 4.0 International License.